I’m heading down to the Inglewood Bird Sanctuary to see which migrating as well as resident birds are around on a wet, cool afternoon. Kezia and I were down there together last weekend and found some wood ducks, a variety of gulls, one heron and a good number of Canada geese. This one was paddling on one of the ponds near the river. Kez and I both like the serene aspects of this scene. 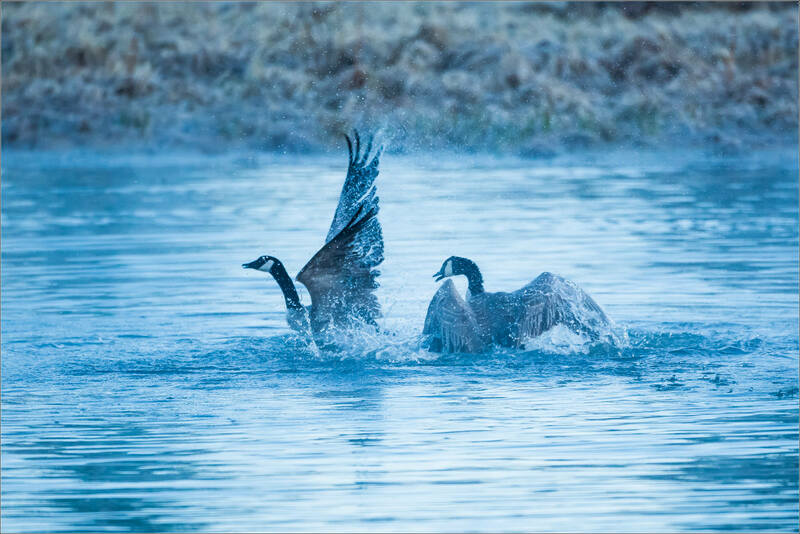 On a snowy day in early April these two geese charged each other repeatedly as I watched them on the edge of the ice at Wild Rose Lake. 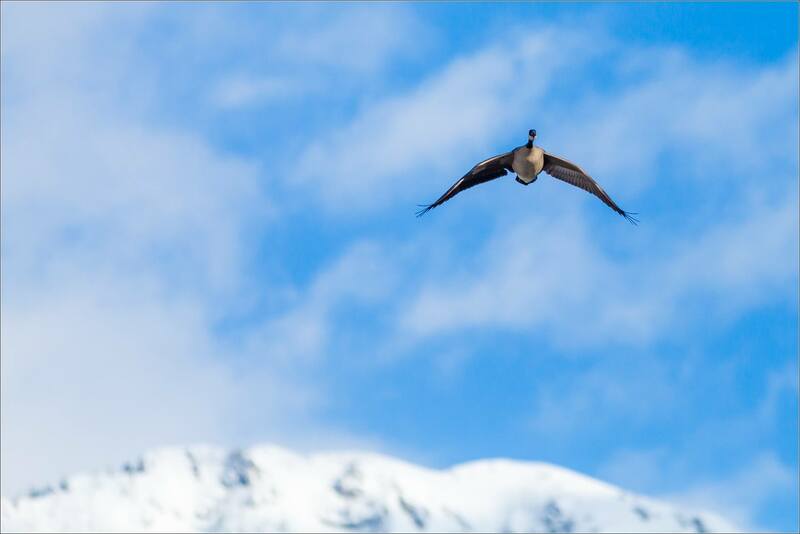 Here the one Canada goose looks bemused by this emphatic display. I went to Wild Rose Lake a few days ago to see what animals might be active early in the day before dawn. I’m waiting for the loons to return to the lake so I visit regularly. On this morning, a beaver and a muskrat were paddling along different parts of the shoreline and there were small bands of ducks nearer to the middle. 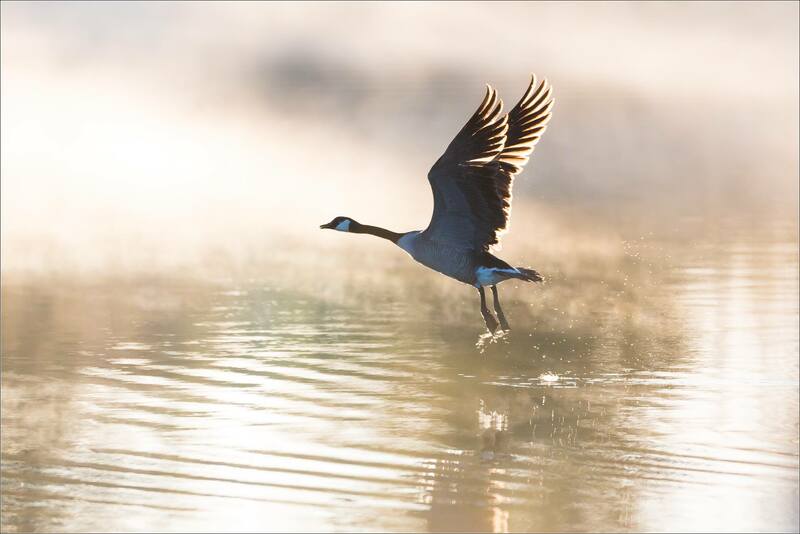 Thin bands of fog blew over the surface and I stopped to watch that dance for a while. 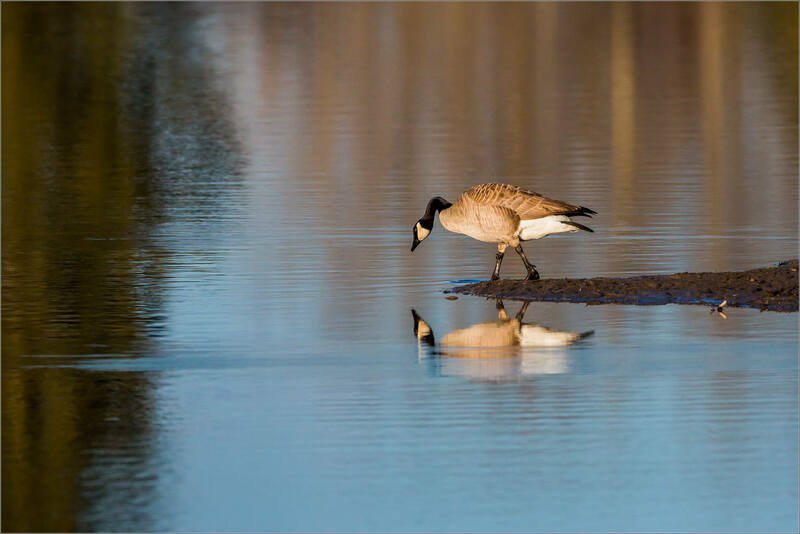 It was a tranquil scene supported by gentle calls from the birds including three Canada geese (Branta canadensis) that floated by. And then, all hell broke out. Apparently the geese were not three friends but one couple and a third wheel. The boyfriend apparently had enough and changed his tone from soft quacking to loud, angry honking. 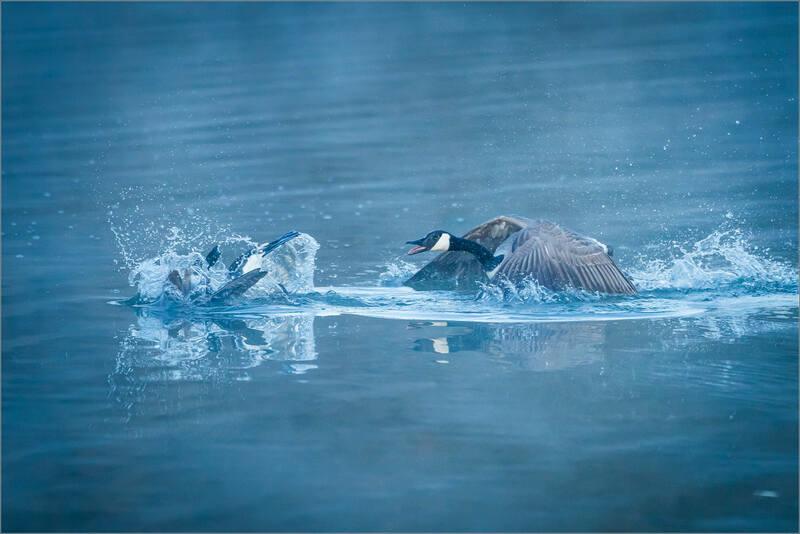 That happened right when he lunged at the other male and the two were in the equivalent of a back alley brawl – maybe a better description would be a pond pounding or a mid-lake mashup. The beaks were the main duelling weapon but wings and bodies were used to attack and defend as well. The main fight lasted less than a minute and then the chase began. The male in the relationship trounced the other one and sent him scooting away. 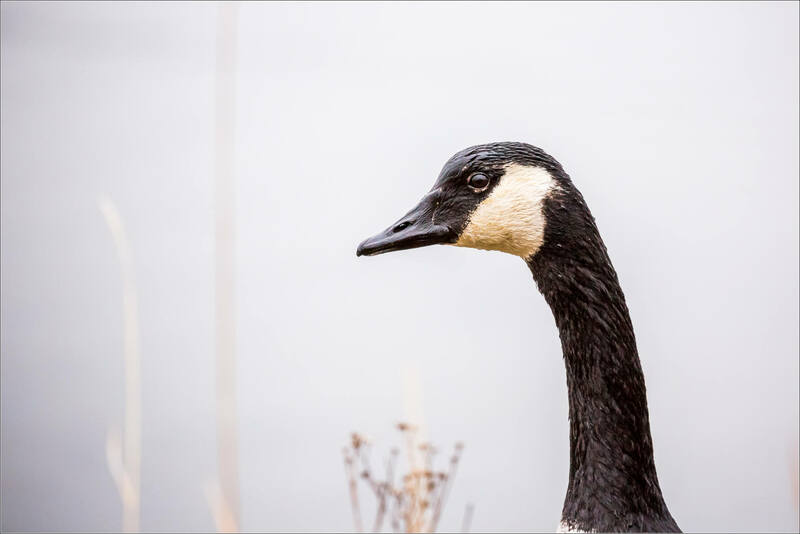 The chastened goose started beaking off from a short distance away and that seemed to rile the champion up. 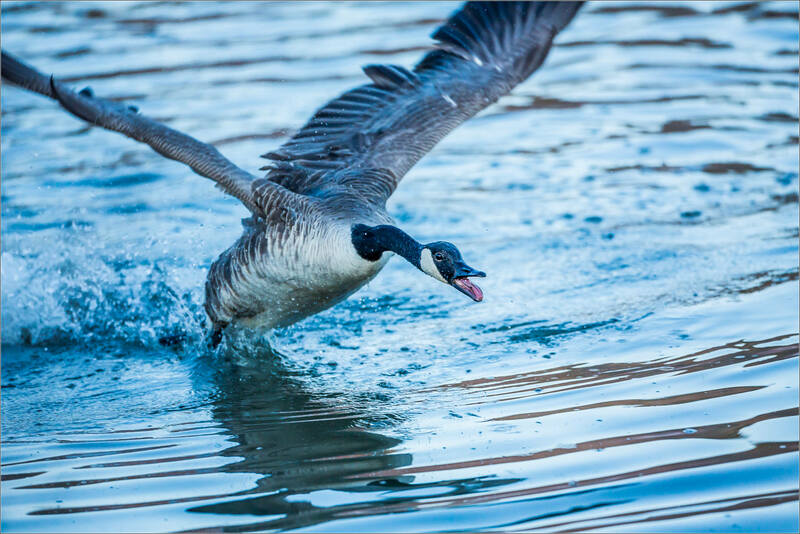 He then swam/flew to the instigator and nipped at him until he dove under the water. Popping up several meters away, the cycle then repeated itself six or seven more times. It was crazy to watch! 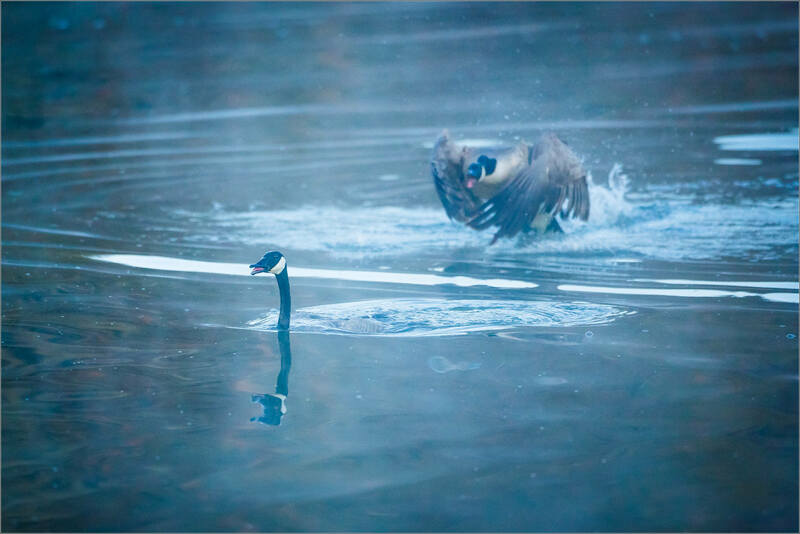 In the end, the lone goose ended up flying across the lake and the lovebirds continued their morning swim. 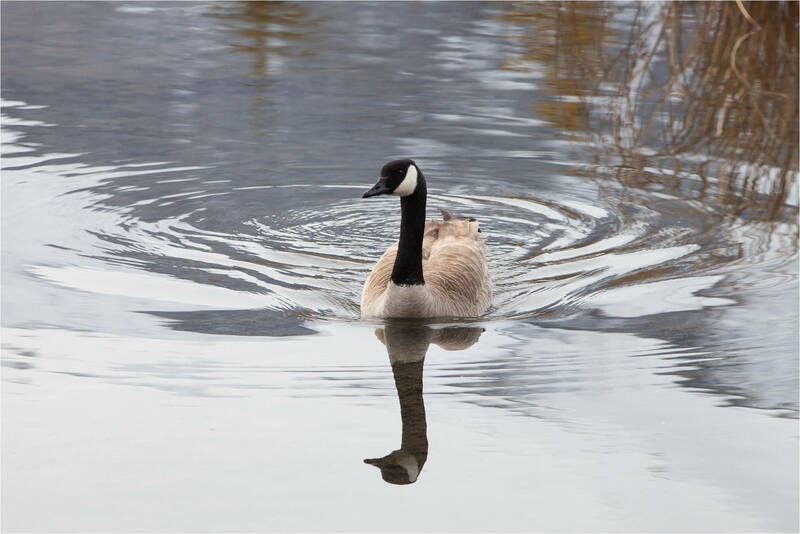 A Canada Goose (Branta canadensis) surveys the lake from a one-legged position on the water of Wild Rose in Bragg Creek, Alberta, Canada. 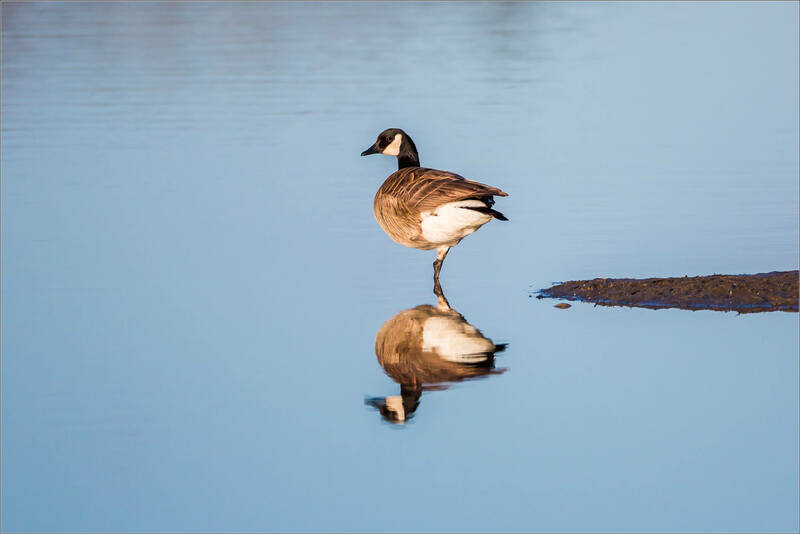 Before taking up this spot, I watched it walk out on the patch of dirt towards the water – it looked like it was checking out its own reflection when it got to the lake’s slightly abstract mirror. 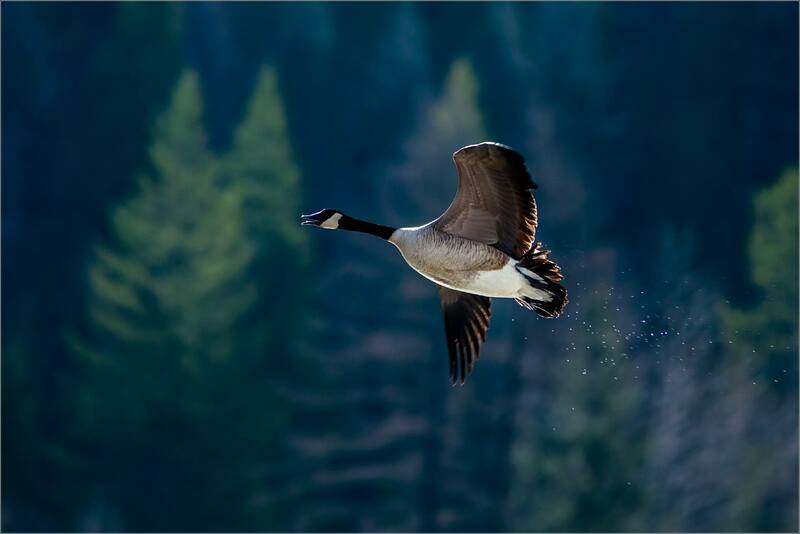 Canada Geese (Branta canadensis) are busy looking for good nesting spots in the Elk Valley and I enjoyed watching them flying along the river when I was in Fernie during Easter. In urban areas, they border on being a nuisance in many people’s mind, I don’t see them that way. 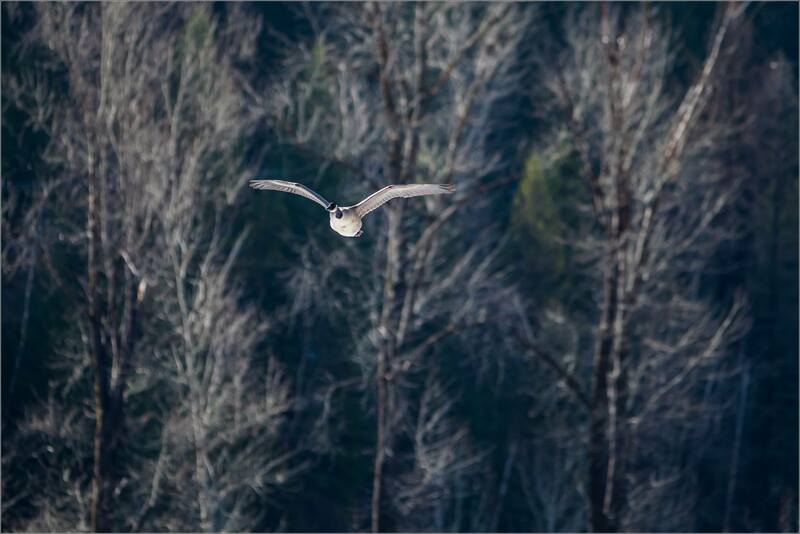 Particularly when they are in flight in a wilderness setting, I find them to be a wonderful animal to watch. The variation in the weather on the morning I spent photographing along the Elk River didn’t hurt the imagery at all. There was fog and light rain in the morning which burned off early leaving sharp light and blue skies. The forest along the river provided a beautiful backdrop as well. I had fun with all of it. 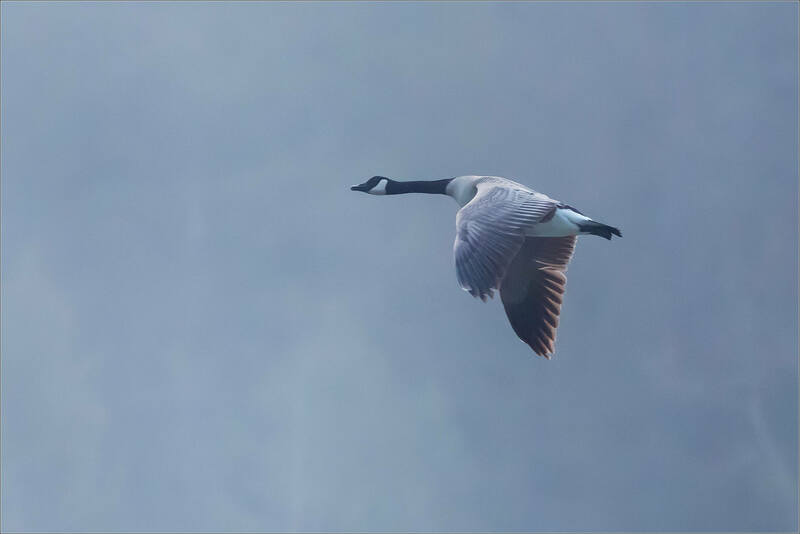 This Canada Goose led a small flock off the lake at the Wild Rose Estates, west of Bragg Creek, and disappeared into the mist rising off of the water. At Inglewood in November, I spent a few hours along the river watching and photographing the mass of birds that congregate on the rocky islets in the middle of the water each night. I was down there in the morning to watch them takeoff, heading out for another day foraging on the prairie. 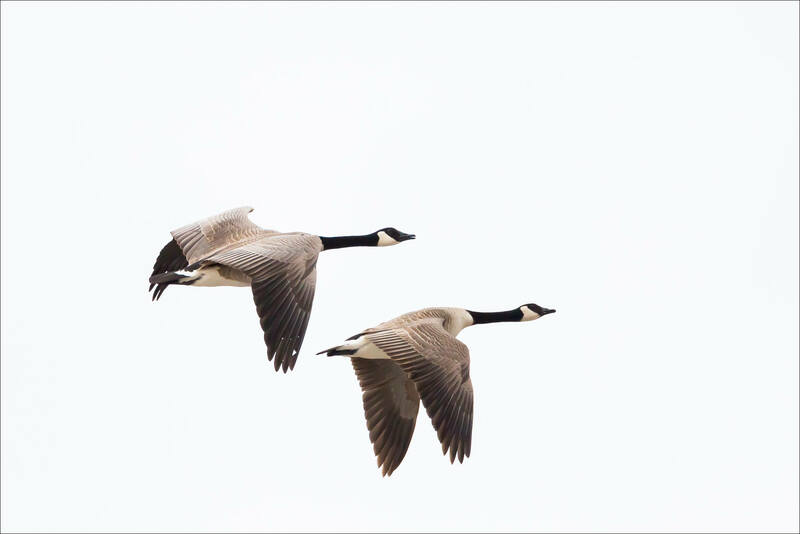 The vast majority of the birds were Canada goose flocks, followed by Mallard ducks and then small numbers of a wide variety of other species. 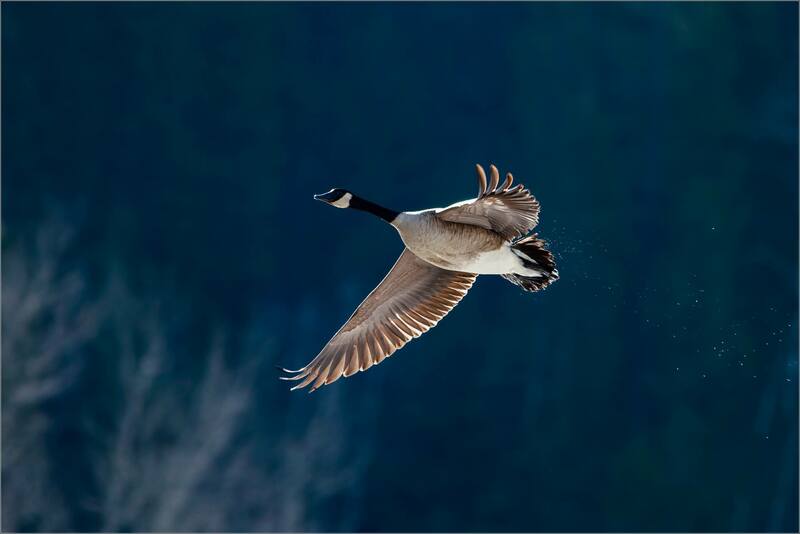 I really enjoy watching both the Canadas and the Mallards taking flight. 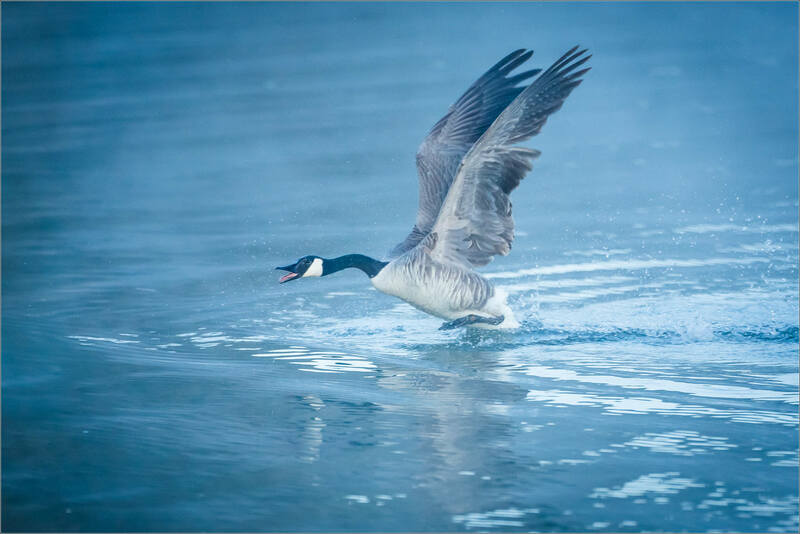 The geese run along the water once they get up above the water, before they are fully airborne. 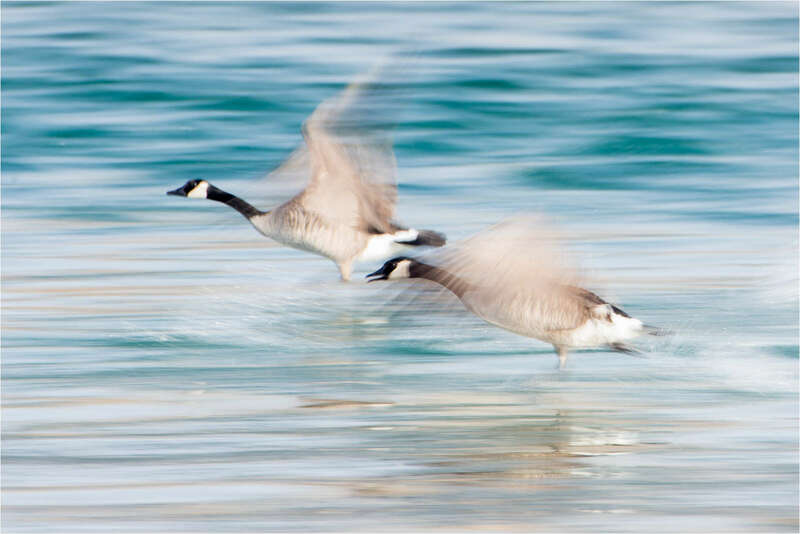 Here, I used a lower ISO and smaller aperture (200 and f/11, respectively) to get a shutter speed on 1/30th of a second. 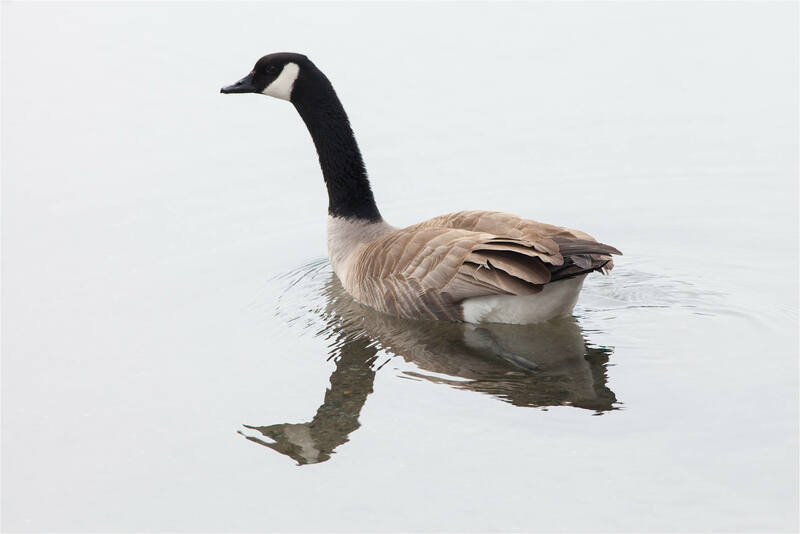 I heard a lady walking past me on the Vermilion Lakes road say to her friend that this was the first Canada goose (Branta canadensis) on the lakes this year. It certainly was the first one I’ve seen paddling around the open water near one of the warm springs that run out of the hillsides and hold back the ice through the winter. The light was diffused by the clouds and the water was calm with no wind to disturb it. 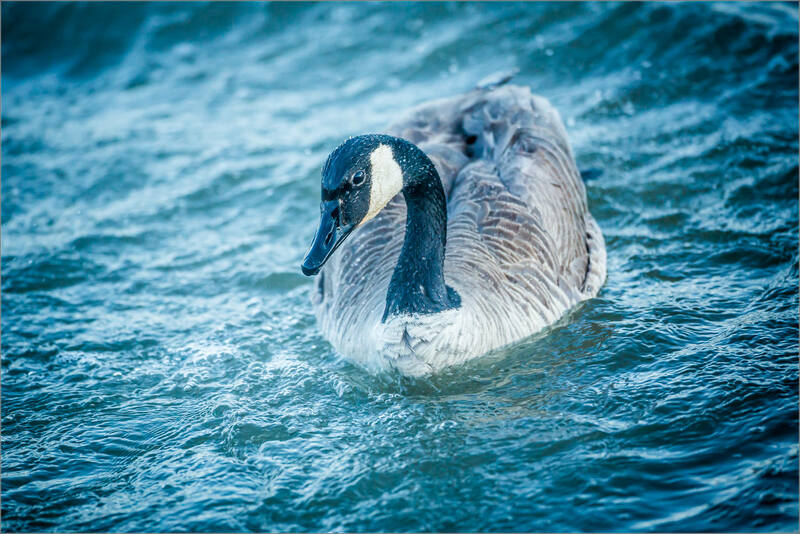 This bird swam around in large circles, lapping us several times as my wife and I photographed it and the kids watched it. It honked a few times but was not angry as when something gets too close to a nest. 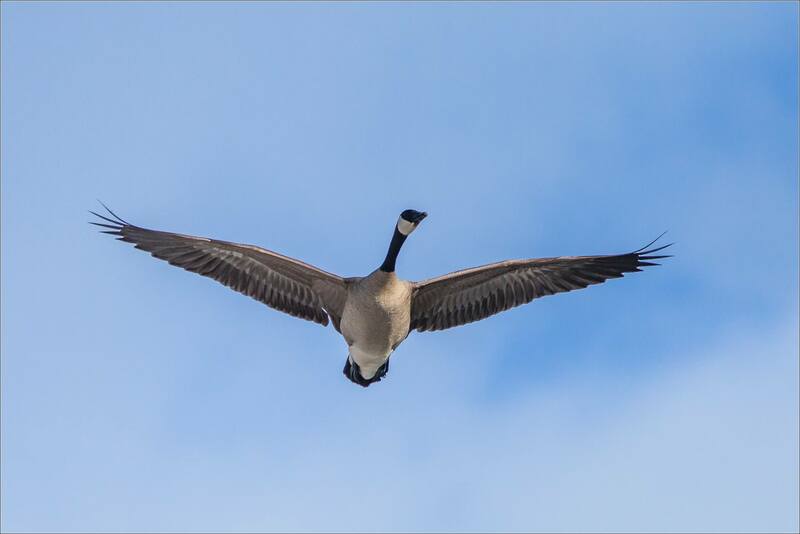 Seemed more like a call for a fellow goose to stop by. 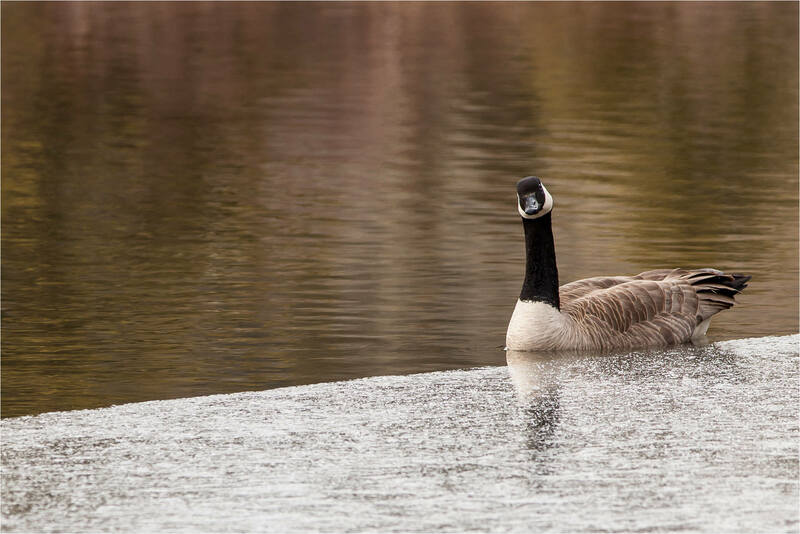 It could have been an inquiry to a potential mate but I did not see any other geese in the area. As it was, we stayed with the bird for about half an hour. 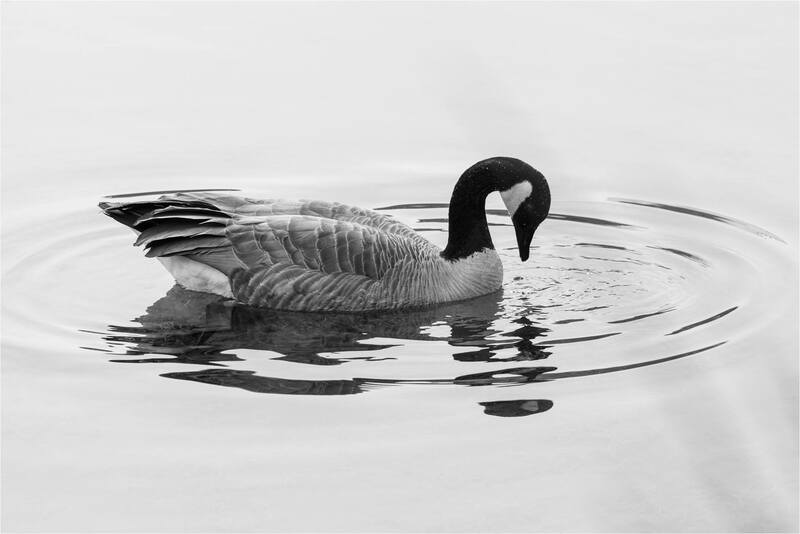 I worked with the reflections, the ripples, the edge of the ice and really enjoyed the personality I saw in the goose as it watched us. I may have been projecting this personality but it seemed very curious and even a little bemused as we looked one another over. 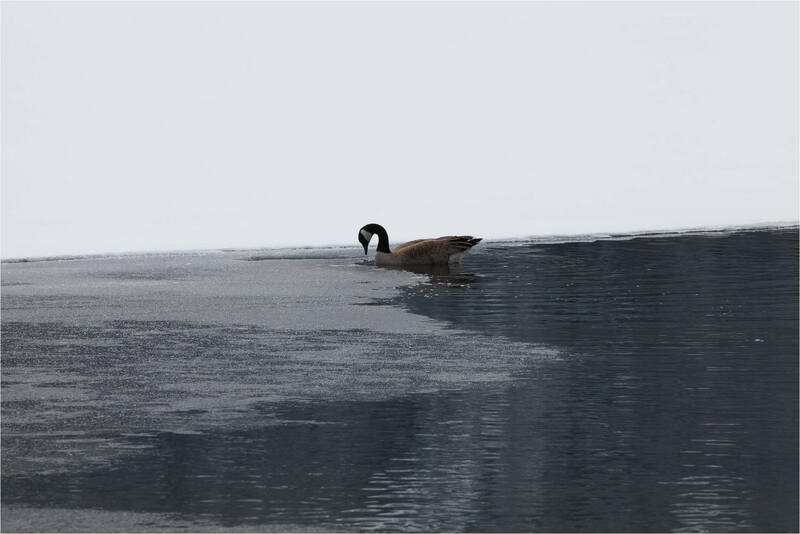 We left when the goose had found something on the edge of the ice that was more interesting than us.